Families could join the Saline County Historical Society in 1879 by donating an artifact to its collection. Started by town founders William A. Phillips and Alexander M. Campbell, the Historical Society was housed in Campbell’s home at 122 South Ninth until 1927 when the collection moved to Salina’s Carnegie Public Library. A bathhouse in Oakdale Park was the home of the Smoky Hill Historical Museum from 1956 to 1985. In 1983, work began to create a new museum in the former U.S. Post Office building at 211 West Iron. The Smoky Hill Museum opened to the public in October 1986. 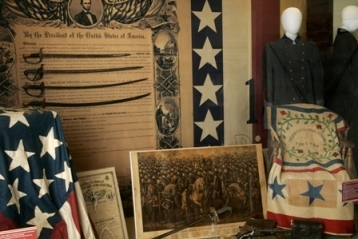 Today, the Museum’s collection features almost 30,000 artifacts from the 1800s to the present day. Artifacts from recent history include Lightening McQueen, crock pots and Army issued clothing used during Operation Iraqi Freedom. Artifacts found in the collection range from agriculture implements to personal clothing from many different historical periods. The museum’s collection includes quilts, medical equipment, toys and games, sewing machines and kitchen appliances. The archival collection houses paper based or two-dimensional artifacts such as books, bibles, certificates, maps and photographs.